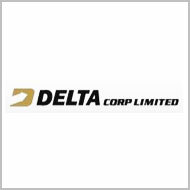 Technical analyst Jatinder Sharma has maintained 'hold' rating on Delta Corp Limited stock. The analyst said that the investors can exit the stock on rally to around Rs 93. The stock of the company, on January 10, closed at Rs 1329.35 on the Bombay Stock Exchange (BSE). Delta Corp has been one of the better performing stocks during the last year. The scrip of the company made around 135% during the year. For the three month period ended September 2010, Delta Corp said that the company's profit increased 28.81 times to Rs 1,263.70 million as compared to Rs 43.87 million during the corresponding period of last year. Net sales for the said period grew 17.77 times to Rs 2,521.40 million. The total income during the quarter rose 17.60 times to Rs 2,527.90 million as compared with the prior year period. Delta Corp registered earnings of Rs 7.56 per share during the said period, recording 23.62 times increase over last year period.